I finished my second triathlon sprint. I finished 20 minutes faster than I did last year, but it should’ve been 30 minutes. After I’d swam 1000 yards, biked 12 miles and ran 1 mile, I got a migraine. Then I decided maybe my shoes were too tight and I loosened my shoe laces. Then I started counting my breaths, thinking it would ease any stress in my head if I breathed in 4 counts and breathed out 5. Then my eyesight really went crazy and I got slightly lost on the the run. Then I found the path again and had to walk, while concentrating on florescent red markers. As I walked across the finish line, I completely lost it and broke down as a friend led me to my car. Now some would read this and think how strong I was to continue, although I didn’t have much of a choice because I was kind of in the middle of nowhere without much sight so the only way to get to Kevin was to follow the path. But I don’t feel strong. All I’m focusing on, for some odd reason, is how bummed I was I couldn’t celebrate all I’d accomplished. I had really been looking forward to that burger and ice cream. I had the flavor picked out and I was going to eat fries. All without guilt. There were tons of people there I knew. It was going to be awesome. I’m pretty sure someone would’ve lit fireworks. Instead, I came home and took meds and closed the blinds and climbed into bed. I stayed there for the next 24 hours. I tried getting up Sunday and ended up back in bed. My husband marveled at how much I slept. So there ya have it. I followed my own training advice: I kept going until they told me to stop. And then I fell down. I’m trying very hard to see what I accomplished and wear my bacon and egg earrings with pride and I honestly do. But for some reason, without the celebration, it just doesn’t feel complete. Sometimes things just need an end and this one didn’t have one and I have to learn to be OK with it. This entry was posted in Uncategorized and tagged exercise, exercising, friends, goals, running, swimming, triathlon. Bookmark the permalink. 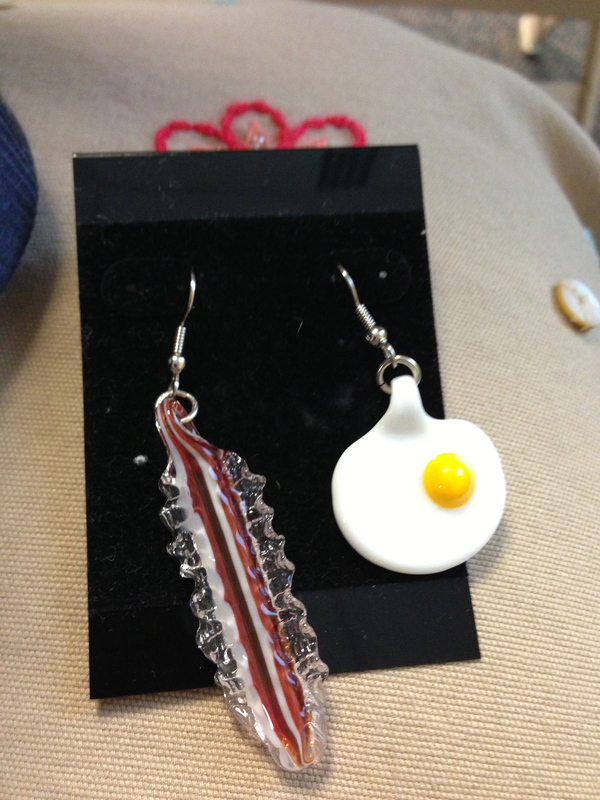 It’s hard to not wear bacon and egg earrings with pride. They scream pride! :). And thanks! Y’know, this type of physical and mental accomplishment shouldn’t be this debilitating ;-). Glad you’re feeling better, Marianne. And congrats :-). My exact thoughts. I’m doing a half marathon and then if that goes sour I’m back to the couch. I can take a hint. You could spend forever analyzing what went wrong, what you could have done differently, etc, etc, blah, blah, blah. Celebrate it. Even if it’s late. Because frankly…there are no time limits for this type of thing. Thanks! I wore the earring and went to Star Trek. 4 people noticed the earrings. I say that’s reason to celebrate!